It is now well known that Russia has been engaging in a military buildup near the Syrian port of Latakia. Shipments of aid and military hardware have begun flowing into Syria as Russia moves to prevent the Assad regime from falling and to maintain Russia’s only naval base currently outside of its de-facto borders. Yesterday (9/11/15) Haaretz reported the delivery of a quite peculiar weapon. 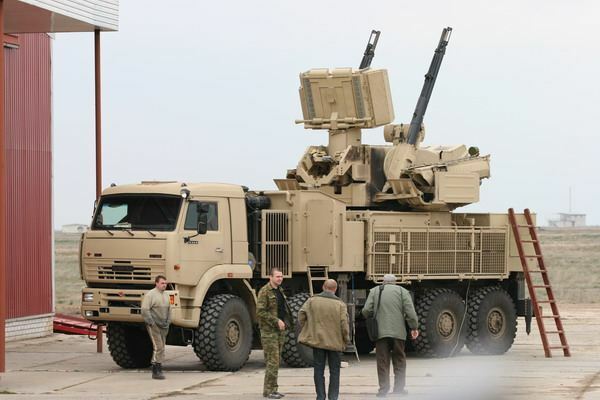 The Russians have begun shipping several Pantsir S-1 (SA-22) anti-aircraft systems to Syria. It is not peculiar that the Russians have sent Bashar al-Assad anti-aircraft weapons as he is clearly in need of them. During operation Inherent Resolve the coalition has all but Ignored Assad. Coalition jets fly fairly freely above the skies of Syria.The occasional Israeli strike on the regime and allied groups like Hezbollah reinforces Assad’s lack of control. clearly if Assad wants to establish his sovereignty and protect himself from attack he needs to control the skies.But why these anti-aircraft weapons? Why would the Russians deploy a point defense system with such a limited range in conflict where the coalition is using advanced warplanes capable of flying at several times the SA-22’s 57E6 missiles 15 kilometer ceiling? The answer lies partially in the SA -22’s capacities as anti-missile system. A variant of the SA-22 is already deployed on the Russian Navy’s Admiral Kusnetsov in such a capability in order to defeat anti-ship missiles. With the Pantsir Russia can deny precision strikes on critical military and command and control installations. They can protect Assad.Putin saw how NATO brought down Qaddafi in Libya with a barrage of cruise missiles, warplanes, ATGMs and attack helicopters. The U.S has already used Tomahawk Land Attack Missiles (TLAMs) to strike ISIS in Syria from as far away as the Red Sea. He does not want his only port in the Mediterranean overrun by rebels and his ally found dead in a ditch like Qaddafi. But the calculus runs much deeper than that.Putin is beginning to close out the possibility of a U.S or Western intervention against the Assad regime altogether .Putin knows how precarious Assad’s position in Syria is. The barbarians are almost literally inside the gates of Damascus. Shells occasionally even land inside it’s center. Nations like Israel and Turkey have proven that they can shoot down Syrian warplanes and strike regime positions with Impunity. Strikes, which are always answered by hollow threats of retaliation that never materialize. With the SA-22 the Russians have a defense against a broad spectrum of coalition weapons.But what is most important are the crews manning the weapons as opposed to the weapons themselves. The presence of Russian crews itself, operating these weapons is another roadblock to a coalition or Israeli strike. Yes, using Russian crews will make the SA-22s more effective against coalition missiles and low flying aircraft. But Russian soldiers will make the systems themselves imperious to attack. The reason for this invulnerability stems not from the Pantsir’s technology or the skill of the crews but from their nationality. Conducting Suppression of Enemy Air Defenses (SEAD) operations that could result in several dead Russians is a daunting prospect. Obama has a well known aversion to escalation as seen by his actions during the Russian annexation of Crimea and his continued denial of lethal aid to the Ukrainians. Putin is betting that Obama would never risk openly killing Russian servicemen and starting a crisis. That risk may also deter the Israelis from striking Assad’s forces as well. This deterrence will give Assad and Putin more breathing room as they attempt to salvage the Ba’athist Syrian state. Putin is following the same strategy with the deployment of the MiG-31 interceptors. The Turks have little to fear shooting down a rusting Syrian MiG-21 but a MiG-31 piloted by Russians is a different story. Although there has been no confirmation that the Foxhounds will be flown by Russians it is hard to see how there is any other way they could be of any use the Assad in the short to midterm without Russian pilots. The Syrian air force is in shambles. Training crews of Syrian airmen to fly a Mach 3.2 capable interceptor seems ludicrous in light of their current situation. Ground attack is Assad’s primary concern. It would make no sense to invest in training Interceptor pilots who would either crash or be shot down by by better trained and practiced Coalition pilots. If one were to view it from the Russian perspective having the capability to deter or deny hostile warplanes entry into western Syria is a political boon to the Russians. Breaking into Syrian airspace would then require either confronting the Russians or cooperating with them. With these deployments Putin has taken the first step in shielding the Assad regime from destruction by foreign powers. Put simply, his strategy is to put Russian men and machines in the way of the coalition. He has created consequences where there once were none and he is protecting Russian interests while he does it.